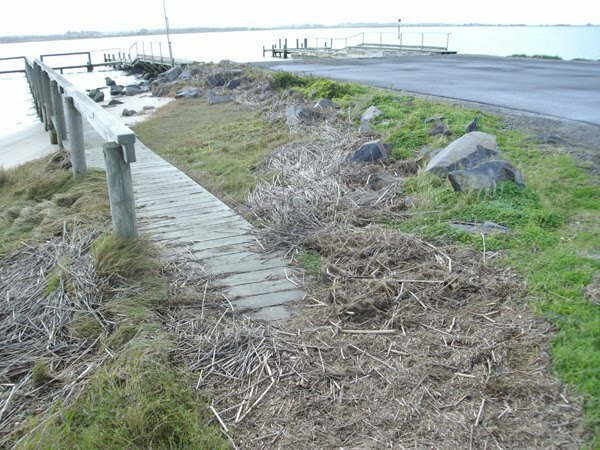 At about 6pm on Monday July 4, 2011, the Goolwa area experienced one of the highest tides observed in the previous 12 months. The tide at Reedy Island was recorded at 1.42m AHD which was approx. 0.6m higher than the predicted astronomical tide at Victor Harbor. The high tide was at the end of a period of spring tides and was due to a combination of low pressure (1008 hPa at HI), large ocean swells and strong NW to WNW winds up to 40 knots. and, despite the closure of 90% of the barrages, an increase of salinities to +30,000 EC upstream of most of the barrages. This event was the fifth major sea water intrusion event since May 22nd but with the highest tides. The Lower Lake salinities had not fully recovered from these prior events. Had more of the barrage gates been open there would have been a major sea water intrusion much greater than the previous events. The Goolwa area would have experienced water levels between those of the 1956 and 1974 floods but this time due to sea water inflows. Historically these events seem to occur once or twice per year and normally, but not always, during the winter months of May to September. However over the period from 2007 to 2009 there seem to have been an abnormally high number of events (4 or 5 per year) although not as high as this latest event. For additional information about this event see the ABC Catalyst Episdode: Wind and Waves on 22 September 2011. For more observations on local seawater intrusions see Ian's Corner. Shown by the deposit of debris from King Tides on July 4, 2011.